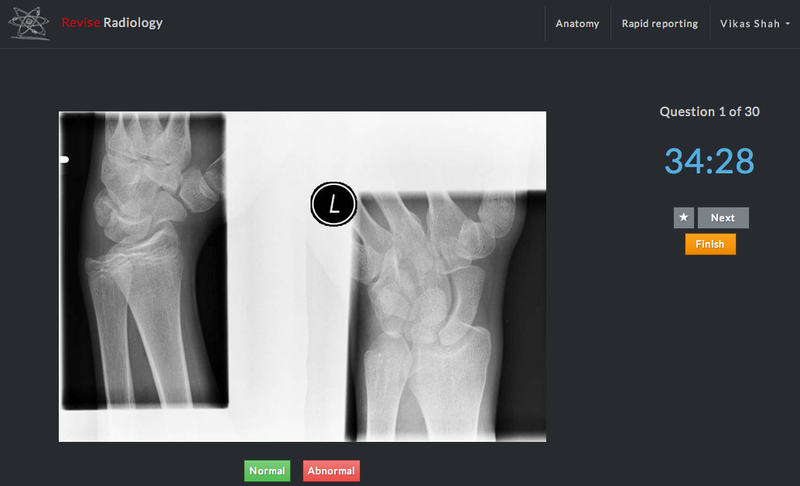 I recently came across a new website called Revise Radiology. This is a resource aimed at providing revision cases for the anatomy component of the FRCR 1 and the rapid reporting component for the final FRCR (2b) exams. Currently, it is an image-only resource, with these exams being based on providing answers on individual images. I have been trying the website for a couple of weeks now, and am impressed enough to want to write a blog post! This really is a fantastic new addition to what feels like a very crowded market - but this stands out head and shoulders over any book, e-book or app aimed at revising for these exams. I have tested it on multiple platforms: iPhone, iPad, Windows PC, Android phone, and Mac - and there is no compromise on quality on any platform. It is remarkable that this has been created not by three full time professional software developers, but by three senior radiology trainees. It is even more remarkable how reasonably priced it is - access to over 1500 anatomy questions for only £30 is a deal that cannot be matched by any book series. Access to 25 rapid reporting packets currently costs £35. The one thing it doesn't offer is any elaboration or explanation of the answers, or any tuition or didactic teaching. This is why I think the website will be complimentary to traditional resources such as courses, rather than a competitor. Attending an FRCR 2b revision course (such as the one I run!) is still useful as a way of testing yourself under exam conditions, using equipment similar to the exam itself, and being given extended feedback. 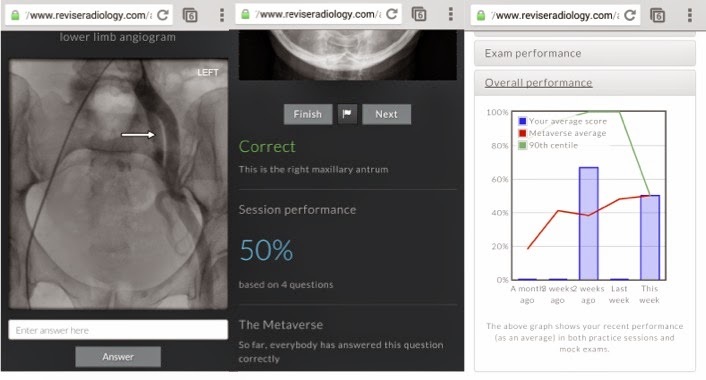 But in the run up to the exam, there is no substitute for getting through lots and lots of questions, and this is where Revise Radiology excels. The website is versatile in how the revision is offered: for anatomy, one can choose to practice a random selection of questions, or choose by modality or body region. The interface is clean and simple: enter the answer in the box below the image, and after clicking the answer box, you will know whether you were right or wrong. An important benefit of this site is that it forces one to ensure spelling and site of injury are indicated clearly and spelt correctly - a good habit to get into for the exam. There is some clever coding behind the scenes which means there is a wealth of statistical analysis available. Following each question answered, as well as giving you the correct answer, you will also be shown your overall score for that session, and the performance of everyone else on that question ("metaverse"). There are further options to see how you may have done on the same question previously. Overall, there is a feast on offer for stats geeks like me! I guess a logical outcome, with enough users' data having been analysed, is a prediction of pass or fail by performance on the website? In the rapid reporting module, each film comes with an option of selecting Normal or Abnormal. If Abnormal is selected, there is a box to enter the diagnosis. There is then an opportunity for self-marking, following which the score for the packet is given with the chance to review all of the answers, and a statistical breakdown as with the anatomy module. A specific useful stat given is the rate of overcalling and undercalling - I think this would help people refine their technique for the exam. This is a welcome new addition to the FRCR revision market, and really calls into question the value of some of the competing material in the market. A combination of multiple platforms, high quality films, real time marking, immediate detailed analysis, and large library of films make this an essential resource for candidates studying for both the FRCR 1 anatomy and 2b rapid reporting exams. Disclaimer: I have no personal or financial interest in Revise Radiology.